I aquired this recipe from a nurse I worked with about ten years ago. I love the fast prep time and delicious results. The longest part is the oven time. I love using this recipe to bring food to someone with a new baby or to someone that is not feeling well. It takes me less then ten minutes to prep and I just send the baking instructions along. It can be frozen too for use at a later date. 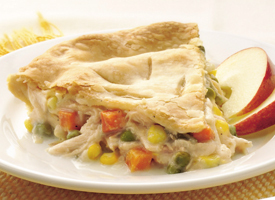 This looks great, and *a* is always begging me to make pot pies! Looks delish! I'd love it if you'd come link up this and any others you'd like to my recipe contest/linky. This looks really good. I'm going to have to make this sometime soon! Was easy to make! I just put it in the oven, am excited to see how it turns out. This is pretty much the same recipe I came up with and use frequently except I use all cream of mushroom and when I have it on hand I use half and half for a little extra richness. Plus I've never tried adding thyme to mine. Definitely an easy and delicious recipe! I didn't bake it before I froze it. It worked great that way.